a different way to think about IT management. CompuCARE is a proactive approach to managing your IT infrastructure. 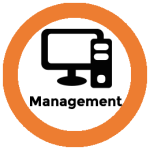 With CompuCARE, we keep your computer systems up-to-date, identify issues behind the scenes, and act preemptively to minimize service interruptions. The end result is that we know about problems before you do, and fix them before you have to call us. Learn more about the components we cover with CompuCARE. With CompuCare, we offer a flat monthly rate per component, so that you get a predictable monthly service rate. You know ahead-of-time what your needs are and what to plan for. Reacting to problems is expensive. By monitoring your hardware and acting proactively, we can avoid many problems entirely, and identify the others early so they can be dealt with conveniently and affordably. Our CompuCare clients have access to one-click support and a single point of contact for questions. We can handle most of your problems remotely, often when you wouldn’t be working anyway. Simplify support, improve productivity, and minimize downtime. Learn more about our various CompuCARE services. CompuCARE is IT management. Simple. We respect your privacy. We will never share your information with third parties or partners.